The Skinny: Failed experiment in storytelling from director Francis Ng and writer Raymond To Kwok-Wai. This examination of the HK educational system provides some detail but very little actual insight. by Kozo: Well-meaning picture from sophomore director Francis Ng shows some real feeling and thought, but unfortunately the film doesn’t entirely gel. 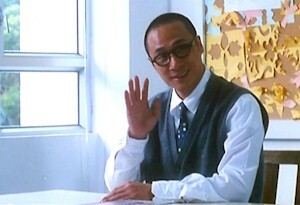 An exploration of the HK education system by celebrated writer Raymond To, it features Francis Ng as a new teacher who can’t adjust to his new students - and proceeds to do things differently. It seems that Ng’s character is retarded in his inability to teach his students, but his innocence and lack of cynicism actually proceeds to make a difference. Or that's what we’re supposed to think. The problem with this film is the notion that all of this is really making a difference. We’d like to think it is, and the students do seem to cotton to Ng’s unorthodox ways, but for every student that finds him an inspiration there are twenty more that think he makes no sense at all. Everything is told in an incredibly opaque manner such that one really wonders what happened. This may be a curse of Raymond To’s most recent scripts. While he has a wonderful handle on setting and incidental character, he has a nasty tendency to leave his characters with nowhere to go. If we’re going to examine the absurd nature of HK’s education system then either we go for all-out satire (not To’s strength) or a film with a definite sense of change. The change that occurs is so minor that it seems to render the film mute. image courtesy of Winson Entertainment Distribution, Ltd.